The 33RD Annual SDSU Geology Alumni Field Trip/Campout will be out of Kanab, Utah along the Arizona border. The above trip dates include two days of travel time. The actual Field Trip excursions will be on Saturday, April 6th and Sunday, April 7th. Dr. Mario V. Caputo, SDSU alumnus and former Professor of Geology at SDSU along with Dr. Thomas B. Anderson, Department of Geological Sciences and Engineering, University of Nevada, Reno, will be leading this year’s Field Trip. This trip was originally run for the Pacific Section SEPM (Society for Sedimentary Geology) in October 2017 and a Professional Field Trip Guidebook will be available for $25 (cash or check only). The guidebook will be available on the first morning of the trip. Due to BLM permit requirements, the trip is limited to 48 participants and the 2 field trip leaders. A HEAD COUNT OF THOSE THAT THINK THEY MAY ATTEND THE FIELD TRIP IS NEEDED BY MARCH 4, 2019, 10pm (PST). This trip is an excellent chance to see some Colorado Plateau geology, Zion National Park, Bryce Canyon National Park, Coral Pink Sand Dunes State Park, dinosaur tracks and just downright beautiful scenery. Many of us plan to stay in the area for a couple of days before or after the trip to take advantage of the geology in the area! 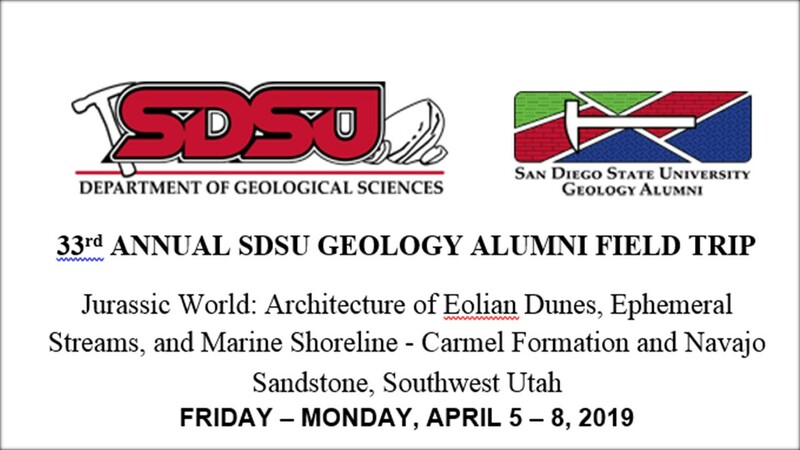 SDSU Geology Alumni, faculty, staff, guests and students are encouraged to attend– especially students. Students will be alums one day, so you might as well start mingling now! MOTELS/CAMPGROUNDS: There are several motels in Kanab for those that don’t want to “rough It”. Some of our group will be at Parry Lodge which may be good for logistics as far as carpooling to the Field Trip stops. Other hotels/motels are nearby. For those with RV’s or trailers, there are several RV parks in Kanab. MAKE YOUR OWN MOTEL/RV RESERVATIONS. A group camping location is not finalized. The camping arrangements are dependent on field trip attendance and camp availability. Camps will likely be “dry camps” and may not be suitable for RVs and trailers. Portable toilets may be available. The camp options will be provided to trip participants in the next week or so. IF YOU ARE CAMPING, LET US KNOW SO WE CAN KEEP YOU UPDATED. We are still evaluating various sites – in Fredonia, Arizona (just a few miles south of Kanab), near Coral Pink Sand Dunes (northwest of Kanab) or points east. Temperature ranges average from the mid 30’s to the mid 70’s for this time of year so be prepared! SATURDAY’S MEETING POINT: The meeting point for carpools for those staying in Kanab or those passing through Kanab on the way to the first day’s location is the paved parking lot north of and across the street from the BLM Visitor’s Center (meet at the old golf course clubhouse parking lot at 755 Fairway Drive – N37*02’35” W112*30’41”). Meet there at 8am. From Kanab, take Hwy 89 east about 45 miles to the BLM’s Paria Contact Station. We will all meet at 9am at the BLM’s Paria Contact Station, get organized and discuss plans for the day. Drinking water is not available here, but there is a restroom. You should bring water, snacks and lunch plus whatever you need for the day as we will be in this area all day just hiking around on designated pathways. SUNDAY MORNING (HALF DAY): From Kanab take Hwy 89 east about 37.5 miles to Rock House Valley Road and turn south along the strike valley parallel to the East Kaibab monocline. Note that 4WD vehicles may be needed for access so carpooling from this turn-off may be required. Reset odometer to 0.0 miles. At 2.5 miles, Five Mile Road goes to the west and you continue south on House Rock Valley Road. At 4.4 miles is the Buckskin Gulch trailhead, continue on until you reach 8.2 miles on your odometer. You should be at the Wire Pass parking area and trailhead which is the starting point for the day. There is a $6 per person entrance fee with seniors 60 and older exempt (National Parks Pass may also apply). We will meet in the parking area at 10am and will be hiking around this area for several hours so bring water, snacks and lunch. COMMUNICATIONS We will monitor Family Service Radio (FRS) channel 4 (no tone). Call for the SDSU Geology Field Trip Group but remember that FRS radios are limited to a range of just a few miles. For those Amateur Radio folks we will also monitor 146.880 – pl=123.0 (Kanab), 147.300 + pl= 100.0 (Jacob’s Lake) Repeaters and….. the National Simplex frequency 146.520. Joe (N6SZO) and Bill (K6GHN) will be in the area and will be monitoring the above frequencies. As Always …. Any of you SDSU Geo-Alumni that are interested in becoming involved with our alumni activities, such as the Annual Banquet, monthly lunch/planning meetings, quarterly trash pick-up and Field Trips or, have a special place in mind that would be good for a future Alumni Field Trip, please let me know. As we have a deadline for ordering field trip guidebooks please email or call by March 4th to tentatively confirm your attendance and guidebook order. Come out and enjoy some spectacular Colorado Plateau geology and relax with our SDSU Geology Alumni Group. Contact Joe Corones, SDSU Geology Alumni Field Trip Chairman, jcorones@gmail.com, Home 858-484-3582, Cell 858-603-5545 for questions. More info to be provided to participants. Remember to make your own motel/RV reservations.